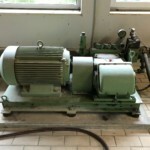 Pumps are machines for the transport of liquids. This includes thick, viscous liquid-solid mixtures and so-called pastes. The applications are very versatile and can be found in all all industries. 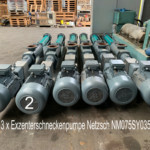 These used Pumps are mainly from mechanical sludge dewatering for feeding filter presses and centrifuges. 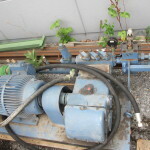 The Pumps are in good used condition, are already dismantled, stored and if desired, can be viewed in our warehouse. 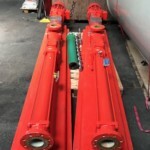 Piston Diaphragm Pumps and Spherical Membrane Pumps are used for pumping abrasive, viscous and corrosive slurries. 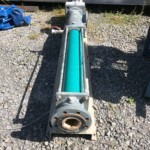 They are often used as sludge pumps in sewage treatment plants for feeding filter presses. Progressive Cavity Pumps, also called Eccentric Screw Pumps are used in all industries for continuous promotion of virtually all media. 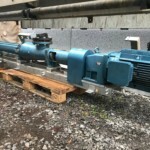 Specifically designed for viscous media as slurries, liquid manure, oil and fats, the eccentric screw pump finds its use. High Pressure Plunger Pumps, also called High Pressure Piston Pumps can be used for cleaning of equipment and apparatus. 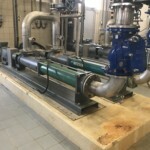 Container, filter cloths of filter presses and pipes can thus be cleaned. Please contact us if you can not find the right Pump.